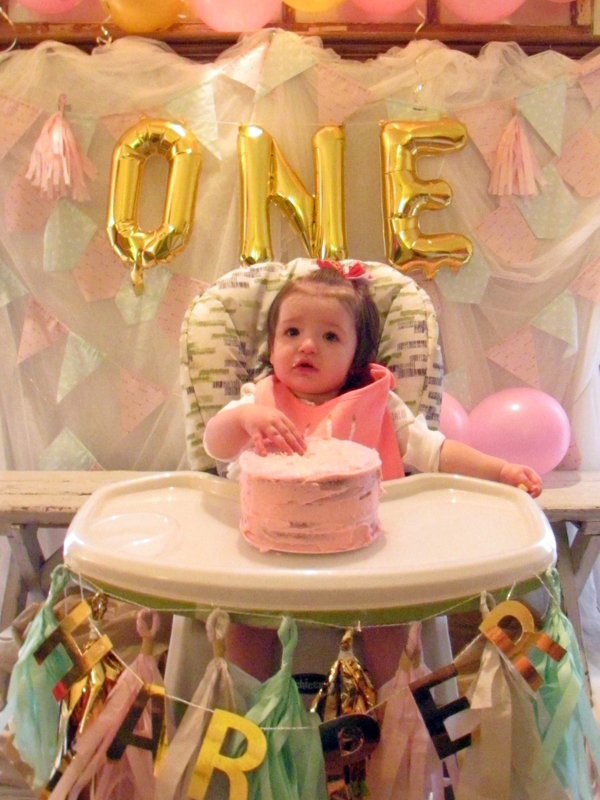 I know its been a long time since Harper's first birthday party. After her party all four boys started baseball and with 3 different teams it has been crazy. I also have been working on myself and focusing on my family and house. 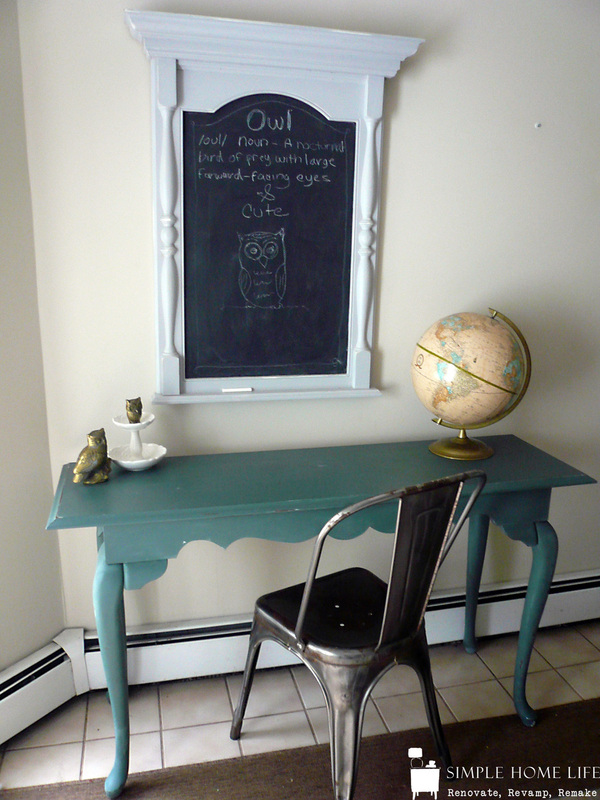 I have not painted a piece of furniture since the hutch. I missed it and although I went crazy with crafting for her party I took a break. My etsy shop is on vacation for the summer but will be back open soon. 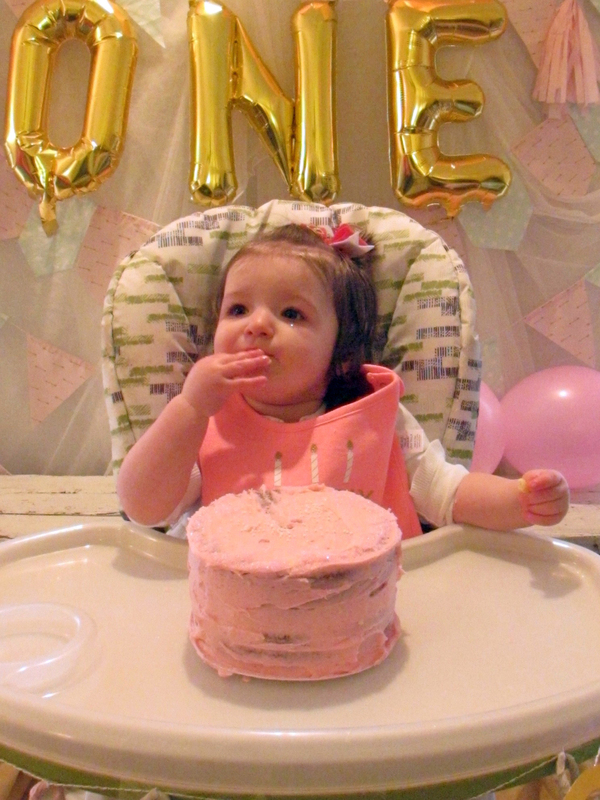 Her party day was rainy, which I knew it would be difficult for good pictures, plus we have horrible lighting in our home. I'm still bummed about but I want to share them anyway. Also the sun was so nice to appear after her party was over. We set up most of the party in our living room. We brought in a folding table, chairs and set the cake and cupcakes where the tv is. I covered the tv with a sheer curtain then paper streamers. I used my silouette machine for most of the detailed decorations. Like this "she leaves a little sparkle wherever she goes" banner using a sparkly pink thick paper and hot glue. This adorable unicorn balloon, which was completely unnecessary since our theme was sparkle but I just had to get it anyway, and it only cost me $2 and it it air filled and basically will last forever if you want it too. The glittery ONE cake topper was made with the silouette machine, I made the cake myself and started to run out of frosting but she didn't need much anyway. The cupcake toppers were also made using the silouette machine, and I used two different papers, a glitter gold and gold foil. I dyed the wood sticks using the same pink frosting dye as I did for the cake. It was easy to do, just add hot water and the food coloring (the fancy kind found at the craft store is what I used) in a bowl and dip the sticks in the water till you achieve the color you like, or throw them all in and soak them for a bit and drain and dry. The stand I used was given to me by my mother and I spray painted it in gold, of course. Besides making the cake, I also made the cupcakes and frosting and frosted them myself. I think buying them next time will be easier. I found this giant balloon at Party City the day of the party, I was picking up latex balloons. It was $5 and included the helium. Definitely worth it, it also lasted for a while. I made the pom pom and felt flowers for a centerpiece using materials I had already. Harper was difficult to photograph, and Zoey our lovely lab was next to her the whole time to get leftovers of cake. The "ONE" air filled balloons were a must. I searched all over online for large helium filled ones but went with these smaller air filled balloons and it cost me $6.00 for the three of them. The O ended up having a small tear in it when I received it and they sent me a new one just in time. I totally recommend this etsy shop where I purchased them and the unicorn balloon. I made a lot of tissue paper tassels to hang in the front of her highchair, hang on the balloons and used around the house. I made the Harper letter banner with the silouette machine again and a gold foil paper. 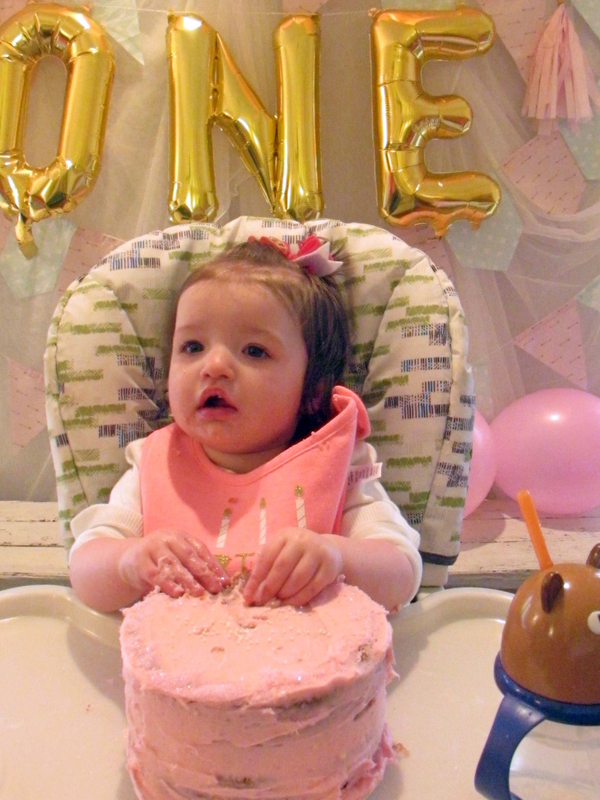 It was very hard for me to get a picture of her in her dress, its the same one in her cake smash photos, gold moccasins are from Old Navy and a cute bow I made which I will share how I made it next. I have a few other details I want to share but I didn't want to make this a long post filled with to many pictures. I will have another post on those soon. I really wish we had better weather, at least the party was awesome and I had so much fun and maybe went a little overboard with the decorations but I couldn't help myself. I can tell you that for her 2nd birthday it will be small and simple.